A simple technique for wiring your buildings for lighting while still allowing them to be easily moved and worked on. 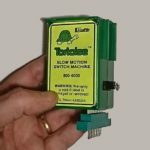 Many railway modellers have lighting in their buildings, and all have the same problem of passing power from the baseboard to the building. 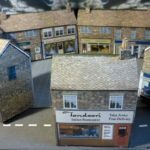 Plug and sockets, terminal strips all work, but how about a quick way to remove a building and replace it exactly where it should live, without the fiddly work of undoing all the wiring. 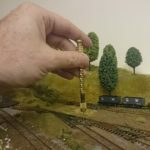 Michael Beardshaw has come up with a cunning solution, using magnets. 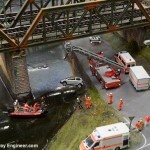 Magnets, of course, have been used in various ways on model railways for many years, even holding buildings in position. But Michael’s innovative solution is is to use them as an electrical bridge to pass electricity between the baseboard wire and the building wiring circuits so dispensing with the fixed wires. 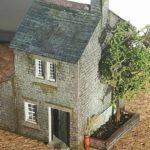 It’s quick, easy and holds the building in place too. Over to Michael for the detail. For my technique, I place discs in the building and on the baseboard. Wires from these go to the supply and building lights. A magnet then sits between them pulling the metal discs together (and with them the building) and passes the electricity from the supply wire to the building lighting wires. When I want to move the building, it’s just a matter of lifting the structure — separating the rings — without having to worry about cutting or unsoldering the wires. 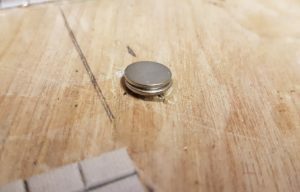 For the magnets, I use Neodymium magnets which have been coated with three layers of nickel, copper and nickel to reduce corrosion. They provide a smooth and clean finish but the wires don’t easily attach to these. The answer to that problem is the metal discs, and Nickel plated mild steel discs in particular. 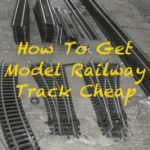 This tip will work with all types of building including houses, engine sheds and offices, all forms of construction material be it card kit, plastic kit or downloadable kits and all scales and gauges of model railway and railroad — N, OO, HO etc — or dioramas. It could also be used for power to station platform lighting. A wire from the supply (under the baseboard) is soldered to one disk, which is then positioned on the baseboard. The inner building structure wiring is soldered to a second disc which is glued to the base of the building. This needs repeating for positive and negative supply wiring. Finally, a magnet sits between the two discs holding them together and passing the electricity between them. When the building is clicked into place, it is held in position on the baseboard, with power now supplied to the internal lighting. The contact resistance of two discs and one magnet is less than ½ Ohm, measured with a Fluke 175 meter. 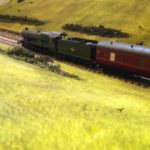 With most model railway lighting consuming around 12 volts DC with current in the mA range, the method should not present any significant power loss, with either LEDs or grain of wheat bulbs. (Larger or higher voltage lights or electrical devices won’t, unfortunately, work with this technique). First, decided where on the building the steel discs are to be positioned. 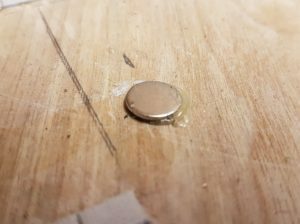 Each steel disc and magnet is 1mm thick, so you’ll need just over 3mm between the surface and the baseboard, allowing for adhesive or hot melt glue. Ideally, the building surface on to which they are fixed should be flat. 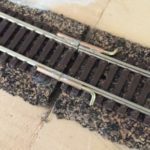 Allowing for the 3mm and a bit, it may require some packing to bring the positioning of the steel disc and magnet within range of the baseboard steel disc. I used plasticard for packing. Mark out on the base of the building, and align to the baseboard where the steel discs are to be placed. The steel discs used are 10mm x 1mm with adhesive on one side. Remove the adhesive, with a thumbnail or craft knife, and solder a wire to the now removed adhesive side. Drill a hole, I suggest 4mm where the disc is to be positioned, and thread the wire through the hole. Make sure that when the disc is laid flat, the solder joint does not lift the disc off the baseboard, if it does countersink the hole until it lays flat. To hold in place I use hot melt glue, but Evo stick Impact adhesive will suffice, it just takes a bit longer for it to gain strength. After completing both positive and negative wires, two more steel discs need to be added, again with wires soldered as before, this time to the building, as previously marked out. The positioning between the disc on the building base and baseboard should be aligned as near as possible, so that apart from conducting the power to the lights, the building itself is in the right place. 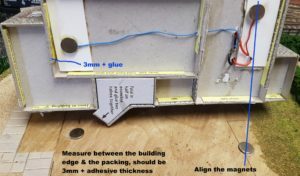 To make sure the height is right, measure from the disc position chosen on the building and the building base edge, which should be a little over 3mm plus adhesive thickness. After the baseboard disc is secure, place the magnet on the disc in building with wire attached. Then at the marked position on the building, add either hot melt glue or impact adhesive. Place the building firmly in position until either the hot melt glue has set, or longer for the impact adhesive. Repeat for the other disc. A little care will give excellent results. Now the building can be lifted and replaced in its right position with lighting, just like that! The magnets and discs can be obtained from First4Magnets who have a next day delivery, more than useful for anxious enthusiasm. 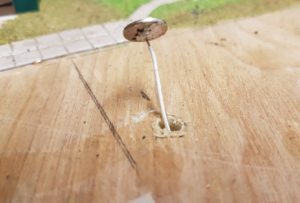 Where there is no easy flat area on buildings, I have used higher strength magnets on a vertical surface, again with the same principle of a flat 1mm disc with wires attached on the baseboard. These magnets are 12mm x 2mm and 1.6kg pull. Part number F312 & £8.24 for 20 + VAT but do not use these magnets flat on your buildings, they will rip the cardboard apart. Words and pictures supplied and reproduced here by kind permission of Michael Beardshaw. I am reading one of your articles for the first time and can not wait to read all of them – many thanks. 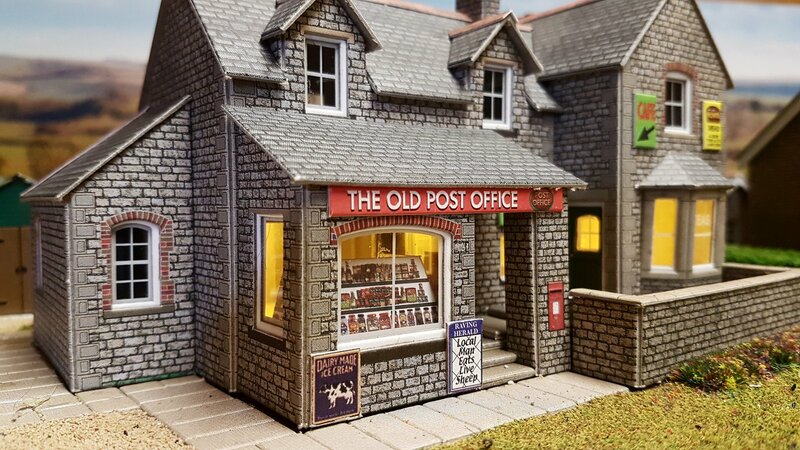 Where can you get the Post office you show please?. Awesome,that had never even occurred to me before,pure genius.